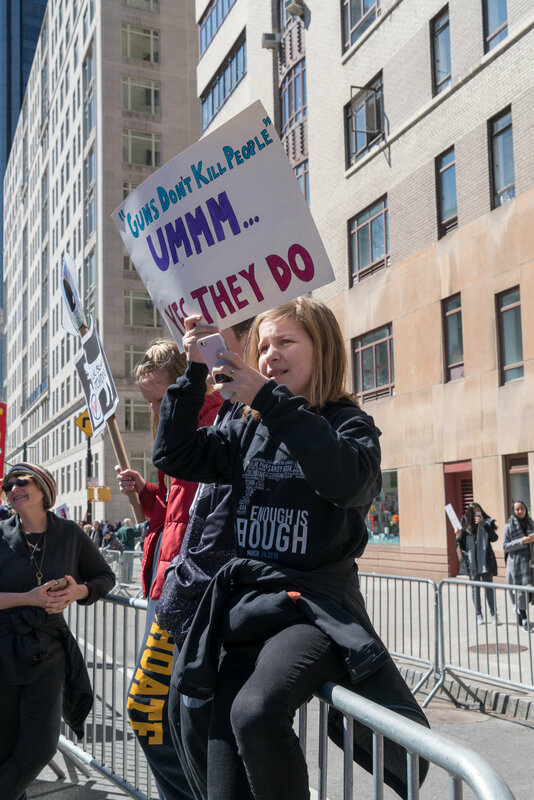 Yesterday we drove Jasper and his friend Braedon into the city to photograph March For Our Lives. The organizers had estimated the number of marchers would be about 20K. I knew the route, it would be the same as the Women’s March, and I knew there would be barricades to contain the marchers in a controlled path. Needless to say the crowds were much bigger than originally estimated. In fact Mayor del Blasio tweeted the number to be closer to 150K. So the route was extended north along Central Park. We couldn’t gain access to the entrance at 72nd St. Too full. Nor could we get in at 77th St. We finally made it through on 81st, shortcutting through the walkways by the Museum of Natural History. And I took my first photo - of the boys - to text to Braedon’s Mom. Thumbs up! We set the boys free on Central Park West with the agreement that we would track them with our phones, and that they would check in with us frequently by text. And the boys darted off, as boys will do. Chris and I took our place in the marching queue, figuring we’d just walk with the group, and catch up with the boys by the time they tired out. But larger crowds take longer to manage than smaller ones. And Chris and I got packed in tighter and tighter, and were held there, in our 3-block bullpen, waiting to begin. Cell service became spotty because of the demand. At first our phones showed Jasper and Braedon behind us, then they showed them 9 blocks ahead, and we knew that our tracking plan had failed. Our texts and phone calls failed to send as well, and we felt that sheer, utter panic of parents who are confined, away from their kids, when their kids might need their support. “Cut through the park?” I thought in horror. And immediately my mother’s-mind had visions of these youngsters crawling on their bellies, in trenches behind enemy lines, in great jeopardy! I wanted to see them, immediately, and have physical proof that they were OK! So Chris and I decided to cut through the barricades too, and we spent the whole march weaving in and out of the sidelines, convincing police to let us through each blockade so we could find our kids. 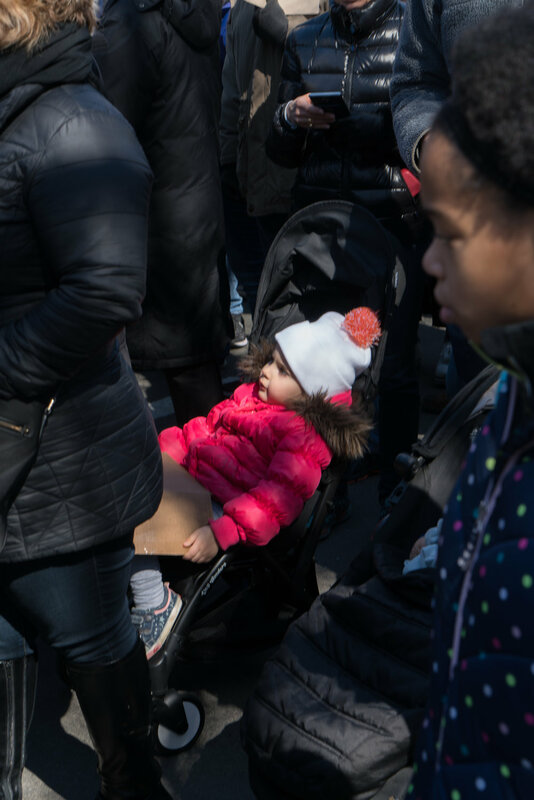 We spend the whole march in a state of heightened anxiety, scanning the crowds for signs of our kids, and glued to our phones trying to get a call through. Eventually the crowds loosened and started moving more freely. Phone service improved, and we talked to both boys. They were ecstatic and were darting in and out of the march as it proceeded down 6th Avenue. We finally caught up with them at 55th Street - 26 blocks from where we had set them free. Just a little over a mile. I snapped another picture of the boys to text to Braedon’s Mom, and realized that was the only other picture I had taken that day. Two pictures, both of our boys. Mothers need proof that their children are safe. The boys were so proud and so full of life, and of course they were starving, as teenagers always are. So we walked to a restaurant for lunch, and sat down, drained, exhausted, but eager to hear their tales. And I realized I was shaking with relief. The boys were bursting with observations, as if they were discoveries worthy of a prize. “Did you see the first graders on Central Park South?” Braedon asked. No, we hadn’t. “They were lined up in the windows of apartments, holding signs, and there were a lot of them!” #MARCHFOROURLIVES #NEVERAGAIN #ENOUGH. Powerful indeed, but Chris and I had been possessed with the tunnel vision of worry, and we had never bothered to look upward along the route. And there we have it. Thirty eight years later we’re still crying over senseless deaths that could’ve been prevented with stronger gun control. Thirty eight years later, and the beauty of Central Park West still fills us with a vague sense of horror, in spite of Strawberry Fields, and the glory of the day, and the good will that surrounded us. Thirty-eight years of worry felt within the space of twenty-six city blocks. Our homes are meant to be safe places, as are our schools. Thirty eight years ago, the grand fortress of the Dakota could not offer safety to John Lennon, just as our schools are failing to protect our children today. And as for the fear that Chris and I felt when we lost track of our boys on Central Park West? Well, as gripping as it was, it was just an inkling of what it must feel like when parents fear that their children are unsafe in their schools. Paralyzing and constricting our sense of safety. Causing us to hold tighter instead of feeling the joy of release. Our children need safe spaces to grow, take chances, and learn to spread their wings. Great minds and great thoughts need great spaces to grow. And until the laws change, our schools that are intended to be places that foster independence and personal growth, will remain at risk of violation. So we are gridlocked with worry. And when our children are beyond our reach, darting through barriers, we feel fear, instead of rejoicing at their initiative and volition. Whether our children grow up to become musical legends, or astrophysicists or Presidents of the United States, we need to give them safe spaces to do so. And we parents need to feel safe enough to be able to set them free. Or else? - we will find ourselves repeatedly feeling collective pain of thirty-eight years within twenty-six blocks.